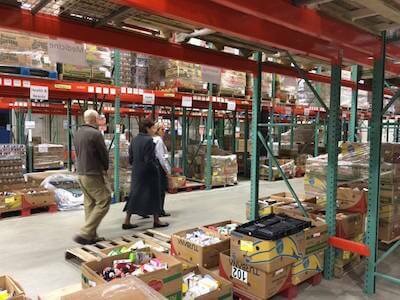 The Good Shepherd Food Bank of Maine warehouse. Photo credit: Good Shepherd Food Bank of Maine. For a long time food banks and food pantries have occupied a respected, but relatively fixed role in the food system. They are the safety net that catches food before it goes to waste and redirects it those in need. But as popular movements to combat food waste reshape the way food moves through the food system, the reactionary role of food banks is changing too. With even large-scale grocers finding ways to compost or donate their would-be waste, food bank staff are having a harder time bringing in enough quality food to keep their clients well fed. Good Shepherd Food Bank of Maine’s Mainers Feeding Mainers program addresses these issues by brokering direct partnerships with growers around the state to procure supplies of produce, meat, and dairy. The program recruits farmers and negotiates growing agreements with them during winter months that include details like which crops will be grown, price points, and volume estimates. Farmers raise the crop and deliver the harvest, or have it picked up, for distribution to any number of 100 partner food pantries around the state. Through a simple invoicing system farmers get paid weekly, a vast improvement over the much longer payment periods typical of other wholesale outlets. The simplicity of the system and the social mission behind it has attracted a lineup of 30 farms, who have collectively raised 4 million pounds of food for insecure Mainers since the program began in 2010. In a given week the food moving through Good Shepherd’s network reaches approximately 37,000 people. To affect change on such an intimate level even while working on such a broad scale is remarkable, but what makes the the Mainers Feeding Mainers model unique is how well the program responds to its constraints. Good Shepherd Food Bank of Maine is the only food bank in a heavily rural state that can take up to 8 hours to cross, where nearly 1 in 5 people are food insecure. Logistics alone almost demand that Good Shepherd evolve into a combination of traditional food bank, broker, aggregator, and distributor in order to get the job done, despite limited funding from the state. In answering the call Good Shepherd has not only orchestrated an immense channel of fresh food for people who need it most, but they’ve also opened an entirely new market for Maine’s farmers, who have been flocking to the program over the past few seasons as a result of word of mouth recommendations from farmers already participating in the program. While some of these farms are non-profit food bank farms who grow exclusively for Good Shepherd and local pantries, the Mainers Feeding Mainers program is largely supported by conventional and organic commercial growers. Against the backdrop of risks and small margins that characterize professional farming, many of these growers have found growing for the Mainers Feeding Mainers program to be an unusual form of crop insurance. In this way, Good Shepherd Food Bank of Maine through its Mainers Feeding Mainers program has transcended its role as a security blanket for its clients to offer another level of security to local farms. By carving out a new, flexible sales opportunity in the food system, Good Shepherd has helped at least one farm move into the black for the first time in six years directly because of steadily increasing purchase orders from Mainers Feeding Mainers. That’s enough to make any farmer feel good, but Perry says the social mission behind all the new-found business is what keeps farmers involved. Perry says the Mainers for Mainers program is in the process of recruiting another 50 farms over the next 4-6 seasons, with a focus on curating a more diversified, year-round product stream to balance out the flush of food that comes in during Maine’s brief three month growing season. Toward that end, the program is also looking for funding to ramp up the state’s severely limited processing infrastructure, which could help the food bank distribute a wider variety of food to pantry and soup kitchen clients during the offseason. On the steam of its success, Good Shepherd Food Bank of Maine is also coordinating with a network of 9 food banks throughout New England to explore how food banks interested in this kind of new, hybrid role can work together to do the same kind of need-based distribution that happens on a local scale across the region. The discussions have already lead to Good Shepherd sending potatoes to the Boston Food Bank, and Massachusetts growers sending winter squash to the other food banks in the partnership. As food banks like Good Shepherd and their partners in New England continue to develop and refine their level of organization, we’re likely to see a new model of hunger relief that’s more aggressive and proactive in addressing the issue than ever before, and redefines how hunger relief organizations relate to capital. Though Mainers Feeding Mainers subsists almost entirely off individual donations and foundation support, the program’s impact has been huge and demonstrates an effective, if ironic way in which money invested in a social service can actually lead to economic development, while addressing the root need. This bodes well not only for those struggling to access good healthy food, but also for local farmers and agricultural communities who are learning that feeding those in need can be a good way of feeding a farm business.